I’ve become quite fond of woodcraft construction kits. Last year I completed the Fantasy Villa and the 1/24 scale Furniture Set. 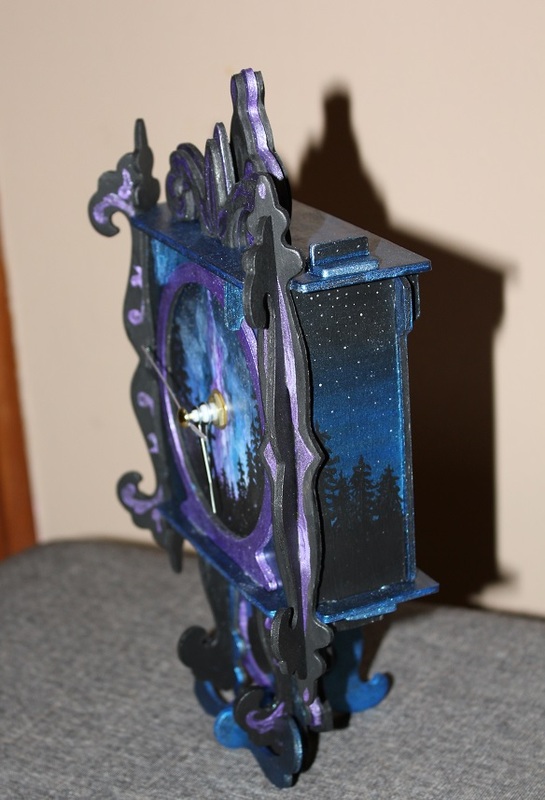 Yesterday I completed a pendulum clock. As with all of the woodcraft construction sets it’s a tongue in groove kit where you pop out the individual pieces from sheets and fit them together. 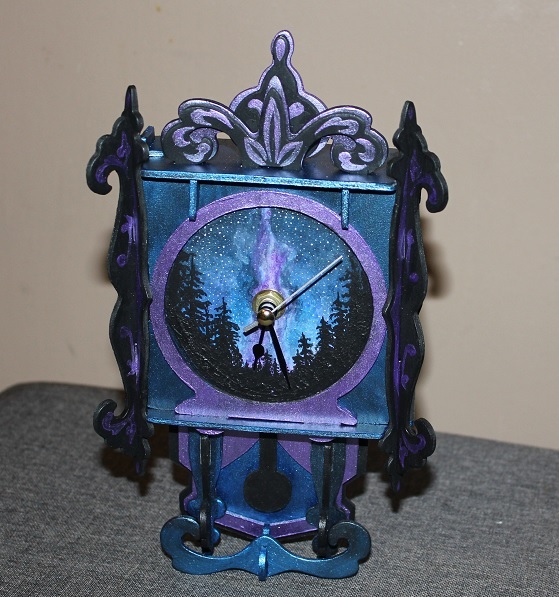 The clock also comes with a clock mechanism that runs on a single AA battery so that the finished product is a functioning clock which can stand on its own or be hung on the wall. The completed piece stands about 10-11 inches high. 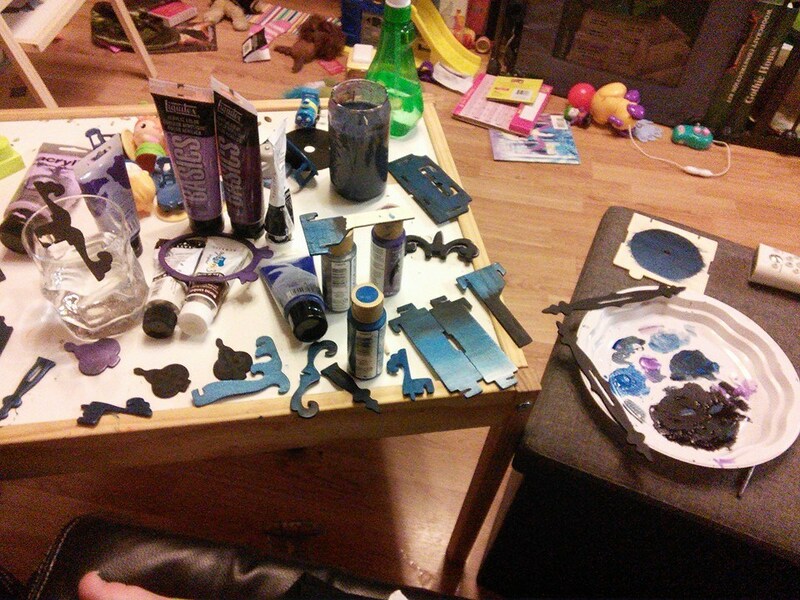 The kit was very affordable at approximately £10 and it was extremely simple to assemble without any glue required. 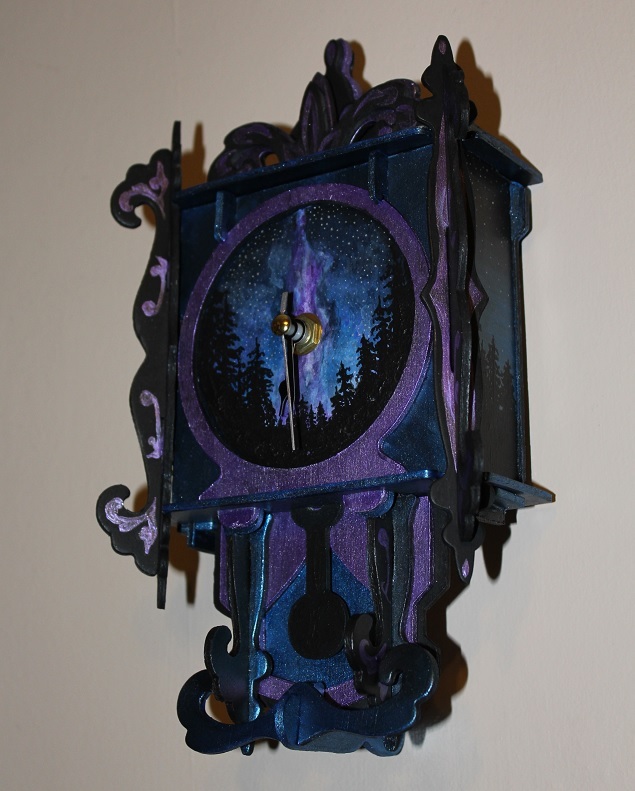 Below I have provided a brief description of the product’s pros and cons as well as several photos of my completed clock. The photo above is from the box cover depicting how the completed project will look (in theory). Inside the box are four sheets of perforated wood containing all of the case pieces, a tiny square of sand paper and the clock pieces. Though I love these kits and I very much enjoy assembling them I have to admit that they would be next to impossible to make without a set of diamond files. This is because the holes are often printed off center and there are choppy bits that need to be smoothed. Also besides things being off center sometimes the holes are actually just the wrong shape (square peg round hole) but can be easily modified with the files. An adequate set of diamond files will run you about $10 or £7 and they come in handy for all sorts of crafty things. I also use a sanding block on the backs of the sheets before I pop them out to help them come out cleaner. It’s sort of hit and miss whether the pieces will pop up nicely for you or become a complete nightmare. On the dollhouse I made all but two sheets popped out very nicely but the sheets that gave me trouble gave me a LOT of trouble. Having a tube of super glue on hand also might be an idea to quickly repair any accidental splintering. 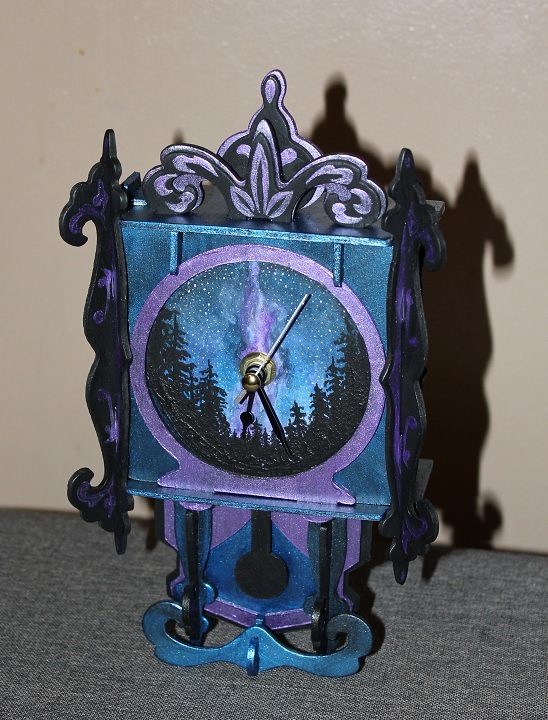 After I had all of the pieces out, sanded and filed I did a dry fit of the clock so that I could plan my embellishments. The kit looks beautiful just as it is but I like to customize things. After I had the clock assembled for its dry fit I noticed a rather large issue. Can you spot the issue in the photo above? I’ll give you a hint, the pieces only fit together one way. I immediately went onto Amazon to read through the reviews to see if this was a common issue but no one else seemed to be reporting that their clock face was printed completely upside down. It wasn’t a huge deal for me because I planned to paint over it anyway but the numbers were actually punched in so what I ended up doing to overcome the indentations was I flipped the whole piece backwards so that I could use the smooth side of the wood. Next came the painting which I managed over the course of a couple of days because there were a lot of layers. I used acrylic paints and metallic paints. The color scheme was all centered around a milky way night sky photo I found on Google and fell in love with last year. 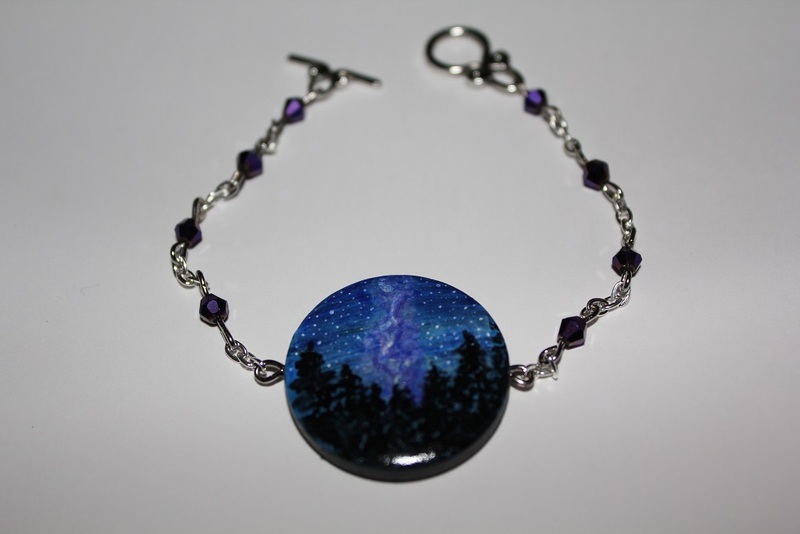 I’ve made bracelets based on the image too. 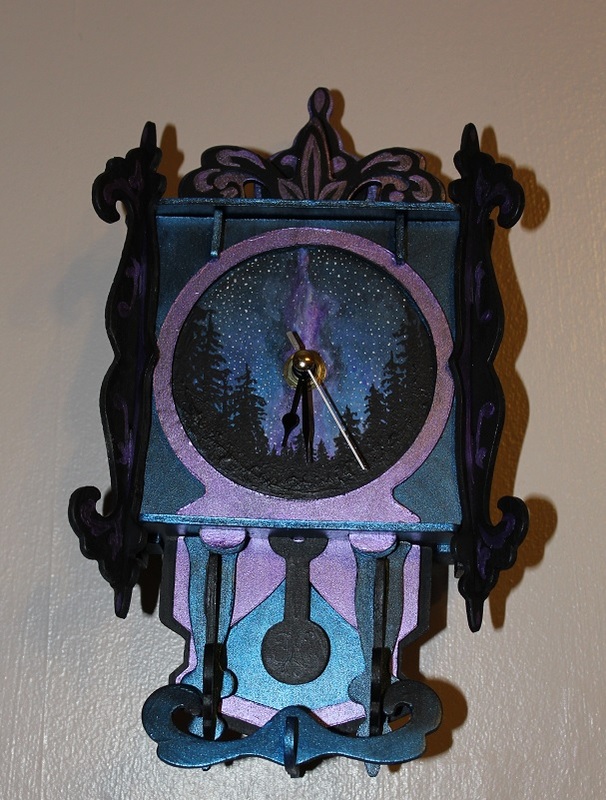 I carried the night sky and tree silhouettes onto the sides of the clock as well. After all of the pieces were painted I had to re file and fit all the pieces to compensate for the extra thickness the paint adds to the pieces and to get rid of any paint that found its way into the slats that wasn’t supposed to be there. Then I popped the whole thing together and touched up any bits that needed touching up. Originally I planned to do something fancy to the pendulum but it just ended up distracting from the central picture so I kept it black. 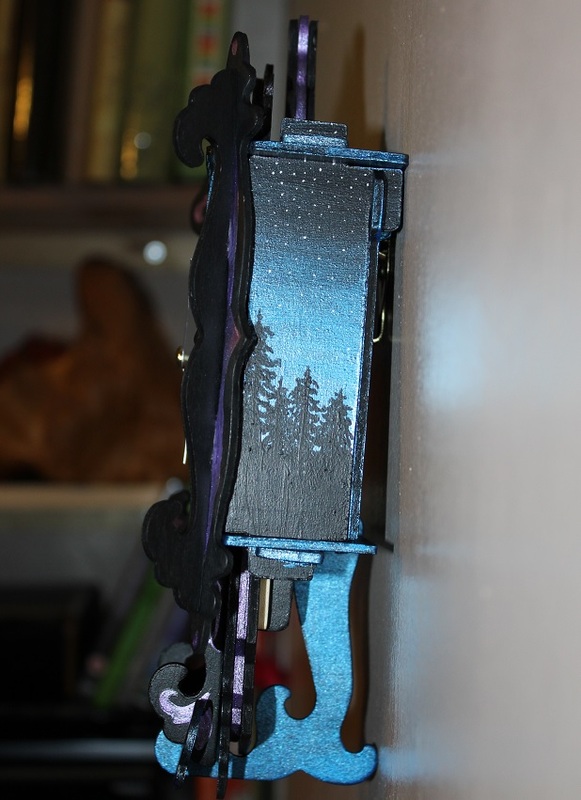 I had also planned to paint the clock hands but I really liked the way they looked black keeping in with the silhouette theme even though they do disappear into the trees sometimes. I did paint the second hand silver as it came painted red and clashed with the color scheme too drastically. The last thing I think is worth mentioning is that when I first put a battery into the clock it ran backwards. I don’t know why it ran backwards but it did. After I popped the battery out and put it back in again though it started running forwards so if you happen to experience the same issue… just pop it out and in again and fingers crossed it will start running correctly for you! Overall it took me about 7 hours (would be 1-2 hours with no embellishing) and I’m really happy with the kit. There is a pretty good chance that I’ll be making more once I work up the enthusiasm and figure out where to put them or who to sell them to. Where can l obtain assembly instructions for pendulum clock? I only went with the photos on the box… as with most of these kits you have to unfortunately just work it out that way. This one doesn’t have many pieces so it’s not too bad. 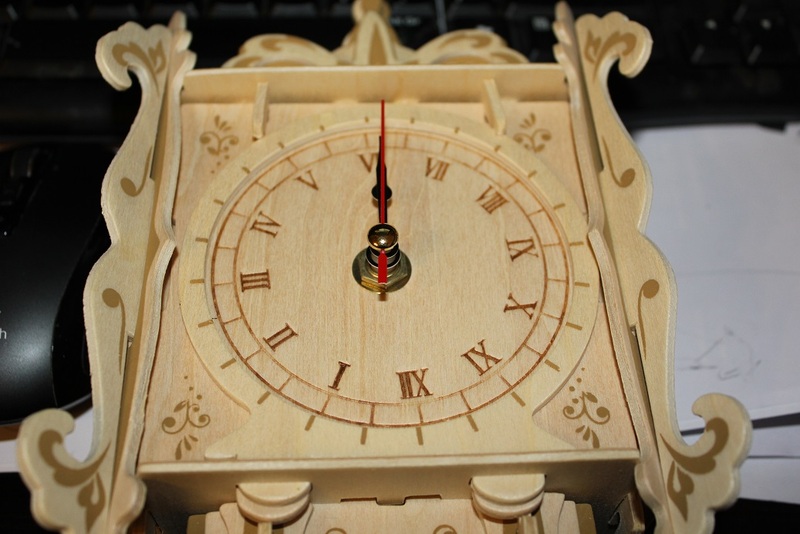 I have another pendulum clock kit to do at some point, I’ll see about posting more detailed instructions when I get it out.